"Can you pack City Hall on Monday, August 13 at 1:30PM?" This is copied from the Change.org petition to save the Showbox music venue in downtown Seattle. The petition is almost at 100,000 signatures, contribute yours and sign the petition here. 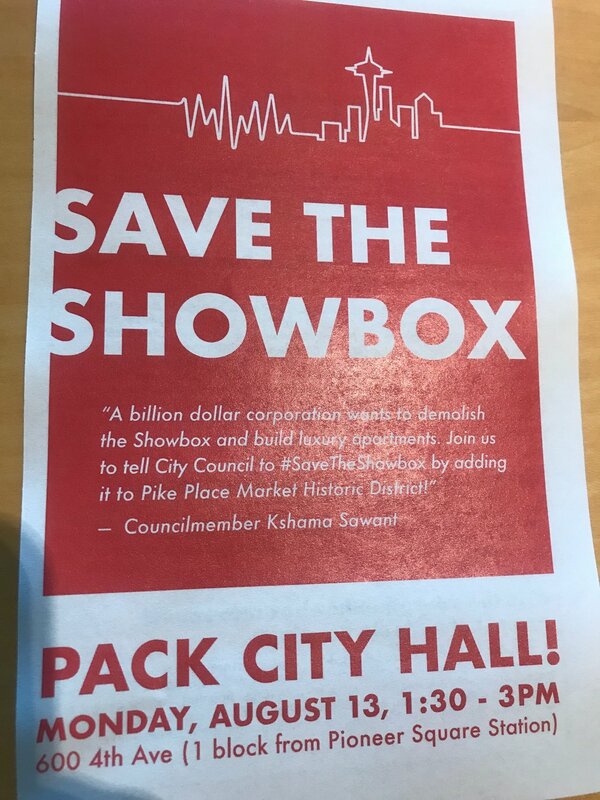 "As you know, Kshama Sawant’s office put forward an ordinance that will temporarily extend the boundaries of the Pike Place Market Historic District, which will give community members time and authority (through the publicly accountable Historical Commission) to Save the Showbox! After facing initial opposition, our ordinance got a 6-0 favorable vote in a City Council committee meeting on Wednesday, which is already a huge victory for us! But it's absolutely critical that this ordinance pass in the full council on Monday, August 13, 1:30PM! Many Councilmembers will say they want to delay the vote. We have to demand: Vote Right Now!! Can you pack City Hall on Monday, August 13 at 1:30PM? Can you call all Council members and the Mayor to tell them why saving the Showbox is more important than luxury apartments and corporate profits? Kshama Sawant (put forward ordinance to Save the Showbox): 206-684-8016"